There has been lots of talk about what breed of dog the new first family would welcome into the most prime piece of real estate in the country. Let it be known that there is no doubt who made the best of one of the most critical decisions a president can make. Were you thinking Reagan? Maybe Lincoln? Perhaps Washington? Wrong! 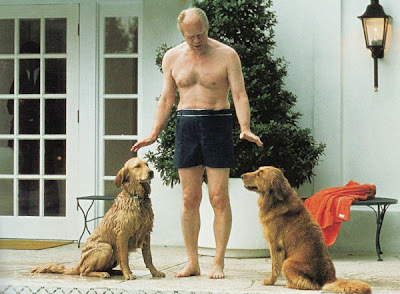 The best president thus far is Gerald Ford. Hands down. The evidence is indisputable. Unrelated question...Does anyone know how much it might cost to have some ominous looking guy in a dark suit watch your dogs through the window while you play with them? I think I might want that. I don't care what they say on the news...the big news today is that it is Molly's 6th birthday. You can almost see the hope and change in her eyes.